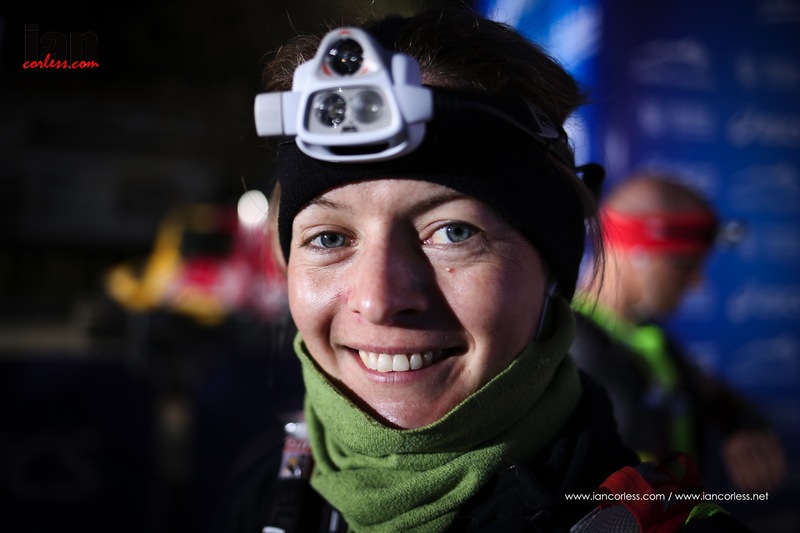 Zoe Salt may not be a name that you know… however, a little look back to 2013 and you will see that Zoe placed 3rd (behind Meghan Hicks and Jo Meek) at the Marathon des Sables. It’s a podium place that didn’t get the recognition it deserved. 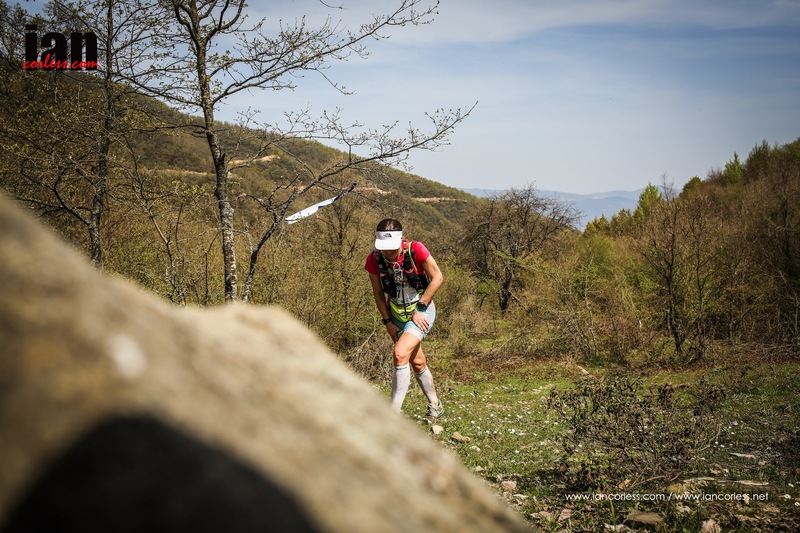 Fast forward to 2015 and Zoe has now won the 130km Iznik Ultra and in the process placed 4th overall. 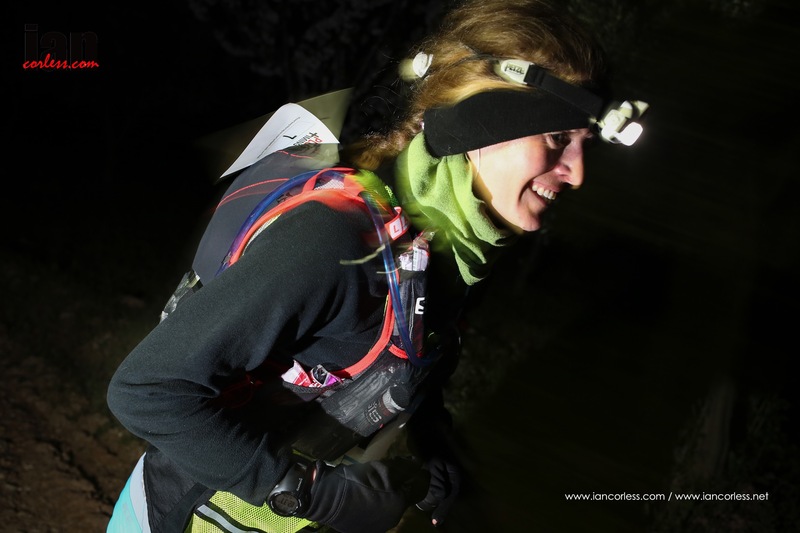 In the coming weeks, Zoe is preparing for Transvulcania La Palma, she knows full well that the racing in La Palma will be very different to the racing in Turkey. 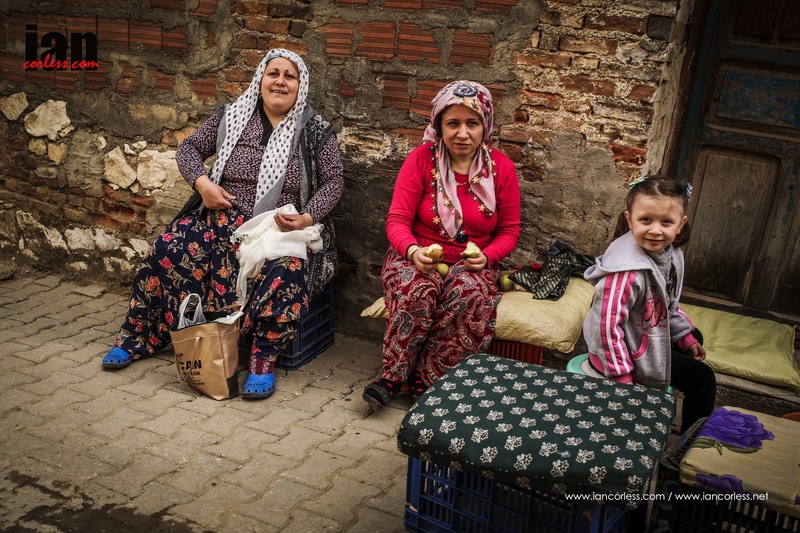 Here Zoe writes about her Turkish experience. I arrived in Istanbul. It’s not quite the West, it’s not quite the East, and it is different, special and unique. Minarets dominate the skyline as the sun begins to set. 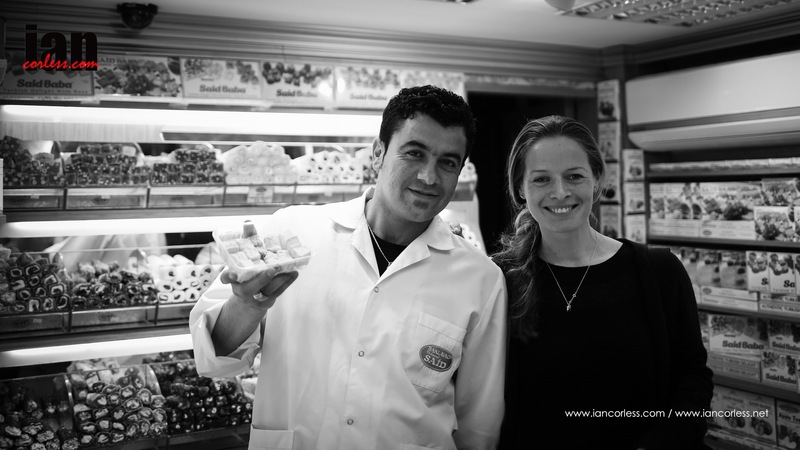 I am a kid in a sweet shop – literally! Turkish delight and Baklava abound. Friday – I awake to the exotic sound of the call to prayer. The sun has come out and it is gorgeous! From the breakfast room at the top of our hotel we realise how enormous Istanbul is (14.4million people). It stretches out in every direction towards and beyond the horizon. 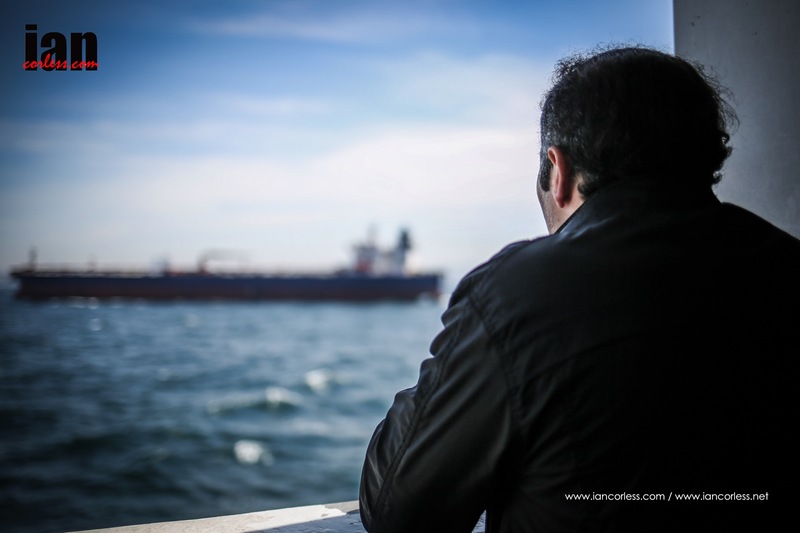 From the ferry crossing we can still see its sprawl an hour after leaving the port of Yenikapi. But enough sightseeing – I really should try to sleep! The race village is already buzzing when we arrive. Where is my list? Pin number to t-shirt – check! Pin number to new t-shirt – check! Take photo of incredible sunset over the lake – check! Then to bed to try and sleep…. count sheep…. count breathing…. so that’ll be no sleeping then…. We leave for the midnight start, which is completely new to me – way past my bedtime. It is cold. I already have on a fleece top, gloves and balaclava … should I put my jacket on? That will require a re-pin of the number. But surely even cold-blooded me will be running in a t-shirt when the sun comes out? No. Leave it alone. Number is on t-shirt. 11:50pm I think I’ll put my number on my fluorescent vest. Re pin! 11:55pm on the start line. Vaguely distracted as a little Labrador puppy comes to see me off! 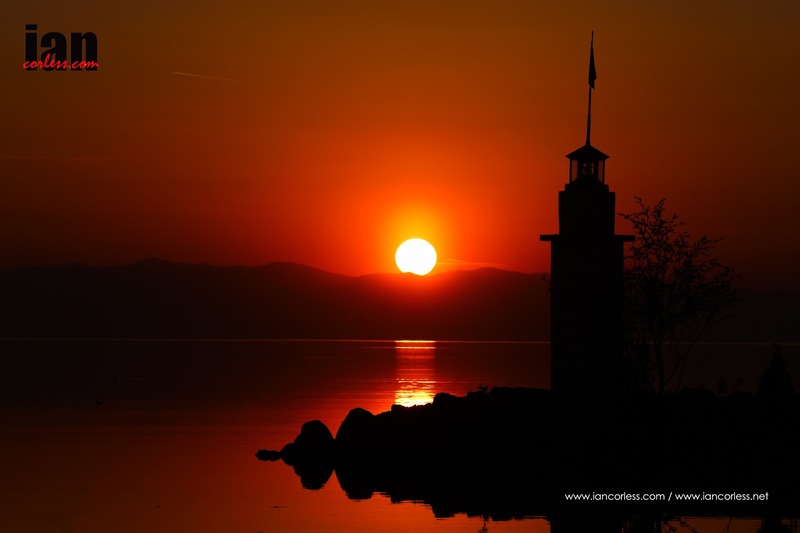 And soon we are on our way into the darkness of Iznik. Within a few metres I am on my own, so I speed up to follow someone as my worst fear is getting lost in the dark. It turns out that this is another of my unnecessary stresses as there are markers every 50’ish’ meters – foolproof even for me! 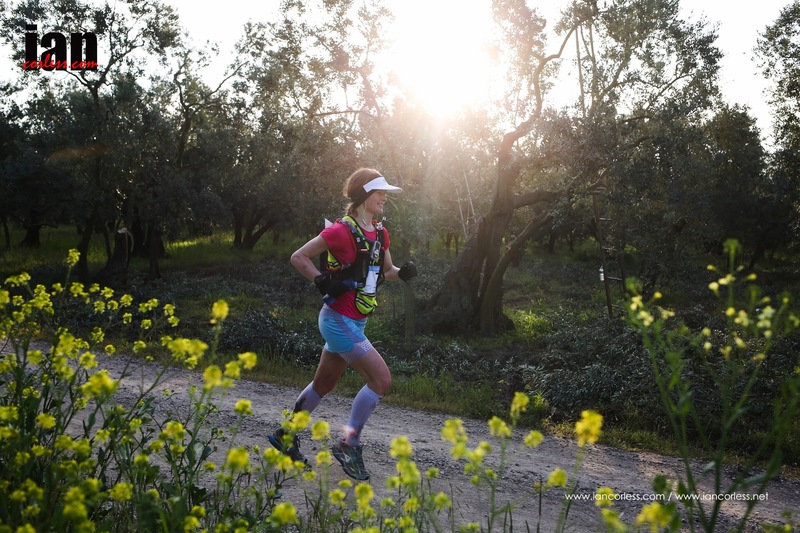 We run through miles and miles of olive groves and trees full of blossom. It is so quiet. Then bam! I am confronted with what in the dark seems to be a near vertical climb. Have I packed climbing shoes or rope? My calves are burning. And this is only a smallish hill, according to the course profile! Just as I’m worrying about the big hills to come, a certain Mr Corless runs past me backwards taking pictures! Dawn arrives and with it the wonderful call to prayer. 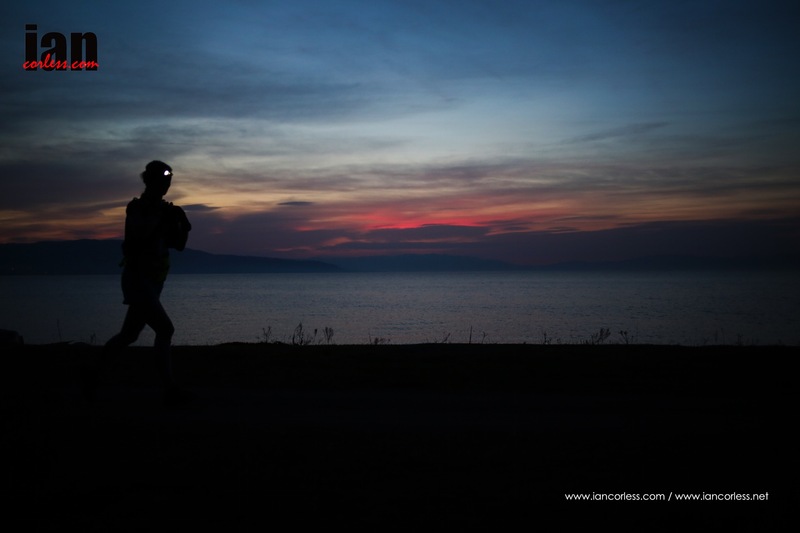 As the sun rises over the hills, bathing the landscape in beautiful colours, I reach the halfway point and am told by the race director that the most picturesque part of the race is still to come. I have caught up with Mariya Niklova and Alper Dalkilic. I like having them in sight, especially as we are hounded by packs of dogs, some baring teeth. I run behind them for miles, them pulling away, me catching up, until eventually, around 72km they slow enough and I pass them. I’m on my own and the uphill begins again. Up, up, up… when do we go down again? I see a runner in front and I am spurred on. Up, up, up – how high is this going? I pass the runner. I have no idea how far it is to the next checkpoint as my watch has died. I’m wondering if this is a metaphor. Finally I start descending. It seems like an eternity to the next aid station. The dirt track gives way to a paved road, a few right turns into a village and there is the checkpoint! I ask a man how many girls are ahead of me and he replies ‘Three.’ My heart drops. ‘Three girls?’ I repeat. I obviously give him a confused look and he says ‘Three people.’ I’m obviously still giving my best confused face as he repeats in very slow English, as if it is me whose first language is not English, ‘THREE. MEN. IN. FRONT. YOU. ARE. 4th’ Well, this I don’t believe so I laugh along with them, eat a bit of orange while they kindly fill my water bottle and am off again. Up, up, up again. I see no other runners but the scenery is as promised. The hills offer views of distant snow-capped mountains. In the foreground a lake, its surrounding fields and minarets marking each village and town. How I manage to resist the urge to stop to take pictures I will never know. Wild tortoises, goats and their shepherds, dogs and toads surround me. I feel like David Attenborough! I keep looking behind me. Where is everyone else? I feel like I’m travelling in reverse. Surely others should be overtaking me? I keep going. Plodding. Finally I reach the last checkpoint. I stick my head under the village fountain because I am so hot! The villagers come out and cheer. It is an incredible atmosphere – I will appreciate it more later! It’s downhill, at least for a bit then the uphill starts again! Where is Iznik? I could see it before but now I’m back in the trees and the lake has vanished. I come to a puddle I can see no way around. It’s quite big but I know it’s not the lake! I put one foot in and half my leg disappears. At least it’s cold! Back on track and it’s now downhill. Iznik finally comes into sight; I keep looking behind me as I feel like I’m barely moving. Still nobody else in sight! A bicycle that escorts me to the finish meets me. I work out it’s about a mile left to go. I concentrate and dream of my legs carrying me a little more. 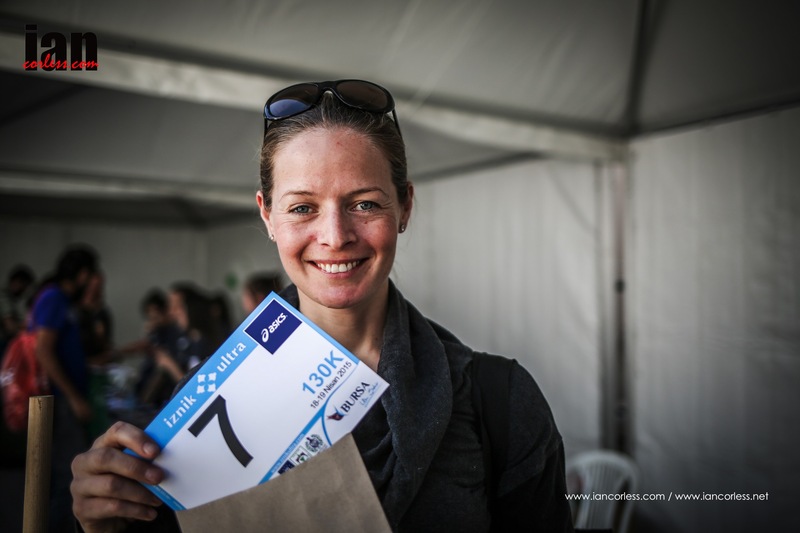 Eventually I cross the finish line…. 4th overall and the ladies winner. Presented with a lovely ceramic medal, I try to say, ‘this is nice, I am from the *Potteries’ (the *Potteries – known as Stoke on Trent in the UK) but now it is they who look on, confusingly at me…! 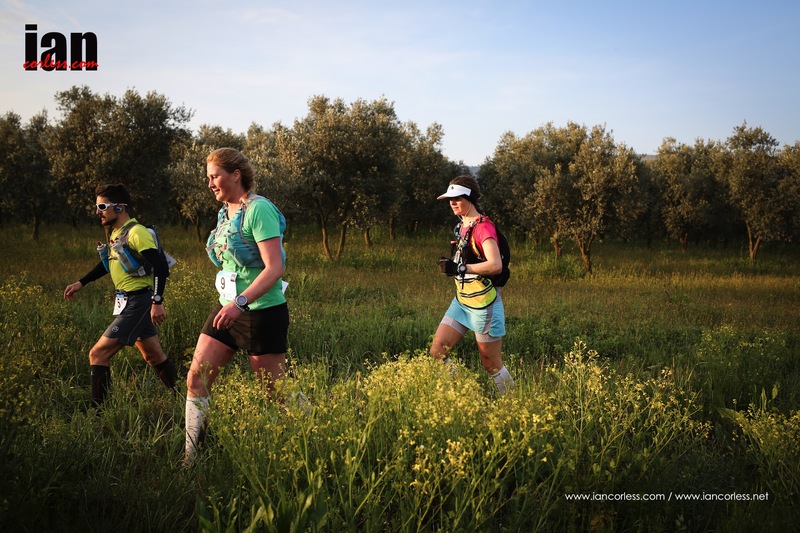 This entry was posted in Uncategorized and tagged brit wins ultra in turkey, isnik ultra, Istanbul, Iznik, marahon des sables, marathondessables, MDS, MDS2013, Running, Salt, trail, Transvulcania, Turkey, Ultra, zoe, zoesalt by talkultra. Bookmark the permalink.